Love a good steak? Me too! Hubs just came home with a hankering for steak after reading this article on how to get fabulously tender steak, no matter what the cut, choice, prime, whatever. We thought we’d give it a try. It. Was. Awesome. The key? Salt. Lots of salt. Whichever cut you choose, liberally sprinkle them with kosher salt. Let the salt sit an hour for every inch of thickness. Can you see how the salt draws water out of the steak…? 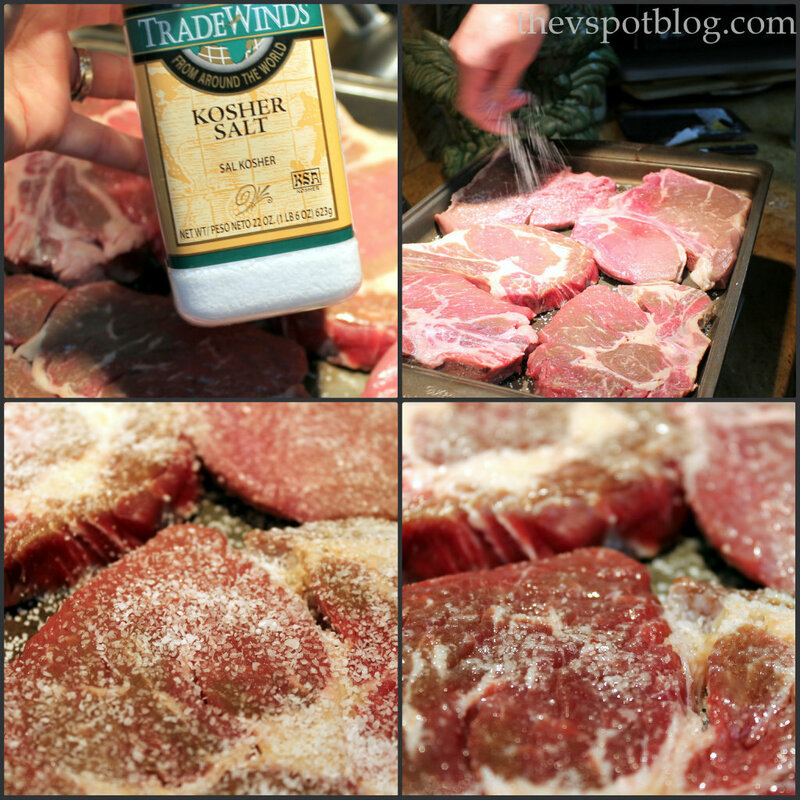 It then sends it back into the steak and the salt tenderizes the protein… there’s some science-y process going on. Please refer to the original article for the scientific facts on how this works. All I can tell you is that it’s magically delicious. We use a cast iron pan to ensure that our cooking surface is very, very hot. You need a nice sear on steak, and we can’t seem to really get a good one on our grill. Cook it up, serve with some Baked Smashed Potatoes, a nice salad, and a nice Cabernet and you have a great meal! I can’t get to the “melt-in-your-mouth steaks” post. Has it been removed? It popped up on my FB page and I still can’t get to it! Well, now I want steak. It looks divine, and I am definitely going to have to try this out! I hope your new year is going fabulously well! Thanks so much for this post. I’m definitely going to give this a try. We started leaning toward a more Paelo type way of eating this year so grilled steak has been a big part of our diet. Since winter has set in and standing in 2 ft of snow trying to grill is not something I enjoy doing, I’ve been desperate for a way to cook steak inside and have it actually taste good. This looks fabulous… I think I will make a special trip to the grocery store just to make this….oy! 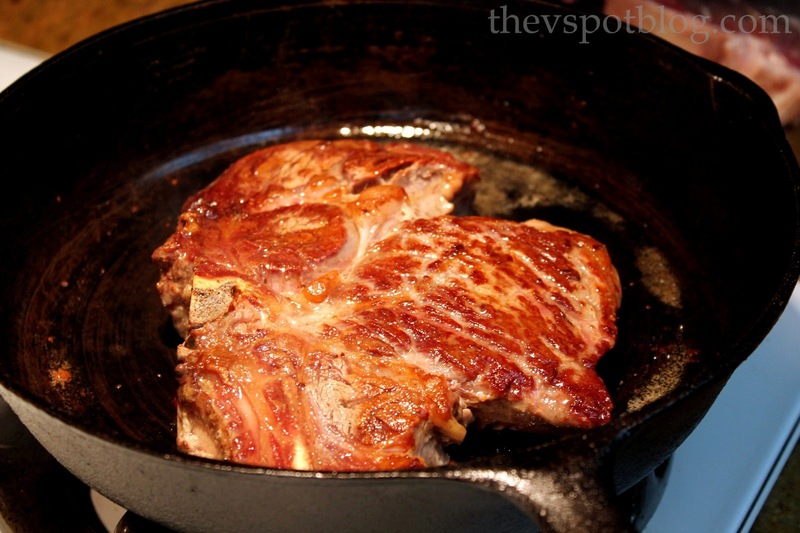 I’ve been cooking my steaks like this for about 6 months since I read the same article, found it on pinterest…. it’s so good! Even my husband agrees that it’s the best steak he’s ever had. I’m not a real meat eater…as in steak and potatoes type things but it sounds good! 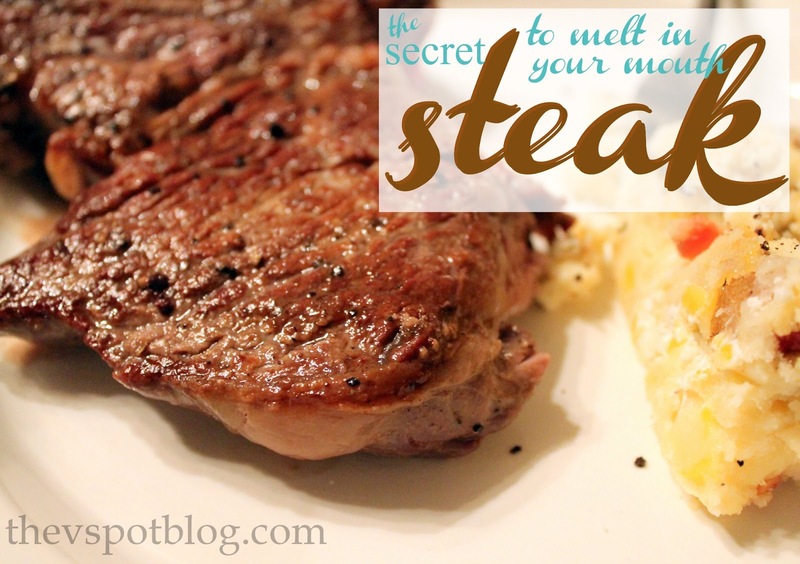 I had no idea about this steak secret and yet I cook all the time. I will definitely have to give this a try the next time we are cooking steak! I never make steak because I don’t know how to make it well. I may just have to try now! Thanks for sharing! HAHAHA Cheap O steak! (any ole’ cut (we used ribeye and porterhouse)! I had to chuckle too! Ribeye and porterhouse are not my idea of cheap! You both read it completely wrong. After doing this step, do you marinate it afterwards or just use dry seasoning? We did not marinate the steaks after doing this. Do you salt both sides of the meat??????? I had the same question, and Yes, the original article said to salt both sides of the steak. News flash: RibEye and Porterhouse are not inexpensive cuts! They are if you buy them from Walmart or kroger! Freaking shoe leather. Do you just give the steak a quick rinse or do you soak the salT ogg? Quick rinse and pat dry. i’m trying this trick for christmas steak dinner today. wish me luck. they’re from kroger and were tough as leather, cooked right out of the package, last time. a major disappointment. Fingers crossed. Yes How did it go? Tried this on some kroger sirloin steaks. I only salted one side (heavily). Let it sit about 2 hrs & 15 min. Rinsed per the instructions, then on to the grill. They came off the grill looking wonderful. But they were as tough as shoe leather. you know the kind, the ones that as you chew, the wad of meat in your mouth seems to get bigger & bigger. i saw another pinterest article to tenderize using baking soda. That was even worse. Even after rinsing, i can still taste the baking soda. Yuck! i wish it would’ve worked. Does it work with sea salt or does it have to be kosher salt? II’m not a good cook to put it bluntLy, but i Followed the instructions and my family was blown away! What kind of steak is in the skillet in your photo aNd how long do you cook it on each side? WOW! I am anxious to try this! Thank you so much! Not sure i will try it again. Followed the directi to a t and it was so salty, you could hardl eat the steaks. I’m sorry to hear this this did not work for you, as it is generally a pretty fool-proof method. You used Kosher salt and rinsed them well?